In his second adventure-filled live theatre show, Levison Wood will share tales from his most recent journeys across some of the most perilous danger zones on earth. With behind-the-scenes moments from his travels over the Caucasus mountains and his circumnavigation of the Arabian Peninsula, Levison will challenge the myths and stereotypes that plague these ancient lands. The 12 date UK tour starts in Sheffield on 28th October, tickets are on sale now. Levison’s fascinating and humorous anecdotes reveal the real life stories of the ordinary people he met who call these places home: from Palestinian fighters to Iraqi snipers; refugees to Bedouin nomads. If you want to know what it’s like to be ambushed by ISIS, have tea with Hezbollah and cross pirate-infested waters in a wooden dhow – then don’t miss Levison in person this year. Levison Wood is a British explorer, writer and photographer whose work has featured around the world. He has just completed his most ambitious expedition to date – a 5,000 mile, five month circumnavigation of the Arabian peninsula from Iraq to Lebanon for an upcoming documentary series, with his accompanying book ‘Arabia’ being published on 1st November this year. His most recent TV series ‘From Russia To Iran: Crossing The Wild Frontier’ aired on Channel 4 for four weeks in August 2017. His latest books include ‘Eastern Horizons’ about his travels as a 22 year-old-man hitchhiking the Silk Road was published in November 2017; and ‘Walking The Americas’ (paperback) published in January 2018. Levison’s expedition walking 1800 miles along the length of Central America from Mexico to Colombia, including the notorious Darien Gap, aired as a 4 x 60′ documentary series on Channel 4 in Spring 2017. Lev’s accompanying book ‘Walking The Americas’ was published by Hodder & Stoughton and went on to become a Sunday Times bestseller. 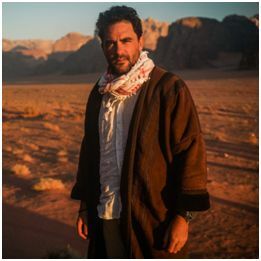 In 2017 Levison went on a 25-date theatre tour ‘An Evening With Levison Wood’ which was a national success, playing to audiences of between 600 to 1000 each night; and in March 2018 completed an additional seven dates. In 2015, Lev walked the length of the Himalayas, a six-month journey of over 1700 miles from Afghanistan to Bhutan, which was televised on Channel 4 as a five part documentary series, airing throughout January 2016. His critically acclaimed book ‘Walking The Himalayas’ has been published in the UK, US, Canada, South Africa, Australia, New Zealand and India, amongst others, and was voted Adventure Travel Book of the Year at the Edward Stanford Travel Writing Awards. From 2013-2014, Lev walked the length of the River Nile – an expedition of 4,250 miles that took nine months and was Channel 4’s most successful factual series of the year. His book ‘Walking the Nile’ became a Sunday Times bestseller. Lev’s work has taken him around the world leading expeditions on five continents and he is an elected Fellow of both the Royal Geographical Society and the Explorers Club.